If you’re looking for high quality and personal service, you’ve come to the right place. At Jamey Cope Auctions we’ll give you the attention and personal service you’ll come to expect and enjoy. We offer the best in auctioning services. We have been in business for over 20 years. Licensed and Bonded in both Arkansas, and Missouri. Let us put our experience to work for you. We handle Farm, Estates, Real Estates, Businesses, Antiques, Bankruptcy, Liquidations, Households, and also Appraisals. We advertising with Big Nickel, Star Shopper, KURM Radio, set out fliers, along with advertising on this site. We take pride in conducting a smooth and friendly auctions service. From helping you through the auction process. To insuring your bidders are greeted with a helpful friendly staff. Visitors have check out our site. 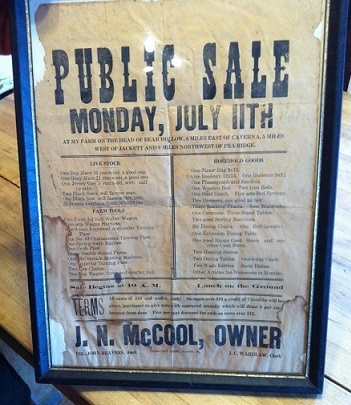 This a sale bill from 1927. Auctions has been in this family for a long time!